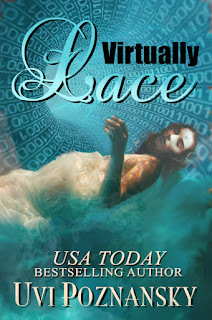 The cover of Virtually Lace by Uvi Poznansky intrigued me and the surreal, dream-like first chapter pulled me into a unique murder mystery full of intrigue and twists. The story begins when Michael, a virtual reality developer, follows a vaguely-familiar teenage woman who appears distressed at Laguna Beach. In the dim light at dusk, he loses sight of her and can't clearly discern the landscape and people around him as he descends the trail after her. When he finally finds the young woman floating in the water near jagged rags, he struggles to piece together how his dream-like observations fit into the murder. To document the crime scene, he tries to take pictures with his smartphone, but it slips out of his hand into a wave. It is then he realizes that his presence so close to the body could implicate him as the murderer. Thus, he sets out to recreate the crime scene in a virtual reality simulation to help him solve the murder. However, his investigation leads him down a dangerous path that could threaten the life of his lover, Ash, who had escaped a violent assault and lost memory of the attacker. The story is fast-paced and full of twists. The climax is riveting with haunting images. Author Uvi Poznansky has masterfully written a character-driven mystery murder that is rich in sensory details, almost dreamlike. An example of the the rich description from the first chapter is as follows: "Electric lights buzzed in the buildings behind him, and foxtail ferns hissed, swaying along the trail. Her shadow flitted over the shrubs, falling father and farther out of reach." These details are important clues to solving the mystery. The romantic relationship of Michael and Ash is engaging and directly impacts the intrigue, suspense, and twists in the story. I was on the edge of my seat, fearing for their safety, as the plot thickens. Virtually Lace is a must read for those who enjoy a fact-paced, character-driven suspense with a dash of romance.